The 1st recipient of IOTA ’s Homer F. DaBoll Award is David Herald of Canberra, Australia. 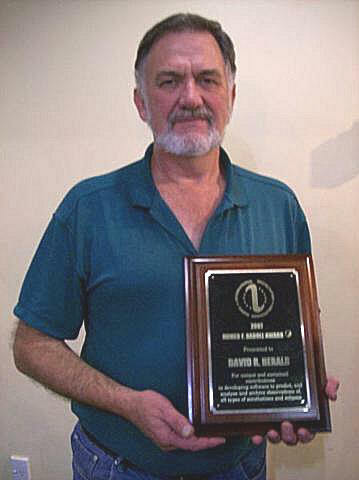 Herald was presented the award directly from IOTA President Dr. David Dunham at the Royal Astronomical Society of New Zealand conference, June 29 – July 1, 2007. David Herald is the author of the widely acclaimed program, Occult, which predicts all types of occultation events, eclipses, transits and he has maintained the database of all observed asteroidal occultations, plus lunar limb data from grazes and total occultation observations used by Occult. Rapid, easily made predictions and data analysis would not be possible without Herald’s Occult program, which has been used since the early 1990’s worldwide by occultation observers.